UC Cooperative Extension farm advisor Janine Hasey told a Willows Journal reporter she is amazed that the peach harvest in Yuba and Sutter counties has begun. Cool spring temperatures mean harvest is expected to be late. "All we are looking at right now is the extra early," Hasey was quoted in a story published late last week. "As time goes on, we will see what happens with other varieties." 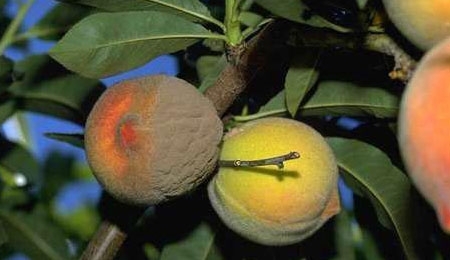 Cooperative Extension recommends pre-harvest fungicide sprays for all varieties to prevent ripe fruit rot. "Put your first treatment on two to three weeks before harvest," Hasey said. The article focused on Sutter County farmer Sarb Thiara who is disappointed by brown rot in his peach crop. "I've never seen it like this," he said. "We call it a dirty crop." Thiara, a director with the California Canning Peach Association, has farmed peaches for 35 years, but in the last five years he has pulled out 600 acres and replaced them with almonds, walnuts and prunes. He has about 500 acres of peaches left and plans to gradually replace those, too. "It's very frustrating, the cost of labor, the cost of chemicals, to even get this," Thiara said, according to the article. Brown rot, seen at left, is a concern for peach growers this year.